We've refreshed our baby stock, and our new intern, Hannah Fenves has created some pretty displays showcasing all the beautiful items we have for the little ones. Now's a good time to tuck away a special holiday treat for the babies in your life! Do some window shopping now and stop by soon to check off your list! Falling leaves, crisp mornings, the harvest moon ... Autumn is on its way, as reflected in our final window design by Mallory Vogel, showcasing some one-of-a-kind furniture and décor pieces designed by Billy Kroft. The perfect seat to gaze at autumn colors or a crackling fire. Sip from a vintage mug, admire the reflections seen in a beautiful painted mirror. 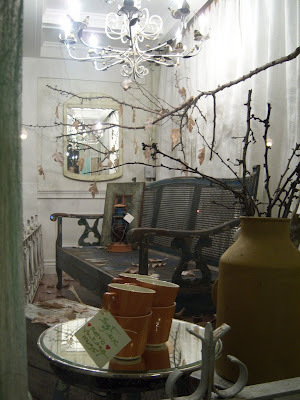 The birds on the chandelier can adorn your sitting area as well. This vignette captures the tranquillity and easy pace of the fall season as another year slows to a close (click on photos for closer view). We are delighted to introduce our merchandising intern for the coming quarter. Hannah Fenves grew up in the east bay and graduated from Saint Mary's College of California with a degree in Studio Art. She is interested in how design can influence people's perceptions of the environment they are in, whether it be graphic design, fashion design, or interior design. She also enjoys collaborating with other artists to create installations that are layered, unique, and colorful; juxtaposing elements that are not often paired together. We anticipate some great collaborative outcomes from Hannah partnering with Johnelle to design our popular store windows and in-store vignettes. 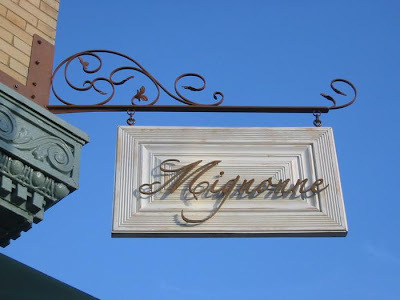 As a reminder, Mignonne has extended our commitment to local artists to include creating opportunities for young aspiring artists to demonstrate their creativity and gain experience in décor merchandising. We have a rotating, 3-month internship program for design and art students in our local community. If you know of a local artist or student in the area that would be interestested in our program, have them contact us at Mignonne (contact details in our blog header). We will be interviewing for the new year (2009) rotation in December. We recently brought in new scents from Voluspa. First new scent, from Voluspa's Japonica Collection - the Voluspa Baltic Amber Triple Wick Candle Tin. The scent is delicious blend of smooth dry amber, warm cedar and sandalwood, and a touch of creamy vanilla for a resinous, woody, smoky delight. The warm tones will be pleasing to men and women alike. Second new scent, Santiago Huckleberry, is the combination of the rare Huckleberry mixed with vanilla pods and sweet sugar cane for a sweet, delicious scent. 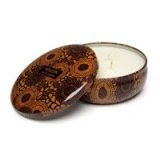 Housed in a chicly patterned, covered tin - the candles not only provides aromatherapy but a lovely décor touch. The tight lids will deter dust when not in use, and the three wicks provide an even burn and maximum throw. You will also appreciate the extended, 80 hour burn time. 12 oz. The first round of Mignonne's internship program concluded recently and it is time to bid farewell to our first participant, Mallory Vogel. Mallory made several great contributions during her rotation, including beautifully conceived painted window designs and in-store displays. She brought a great positive attitude and drive throughout the time she spent in our boutique. Mallory is freshly launching her career as a window designer and merchandiser at an eco-savvy design store in San Francisco. We wish her all the best while sharing a photo of her final window design! 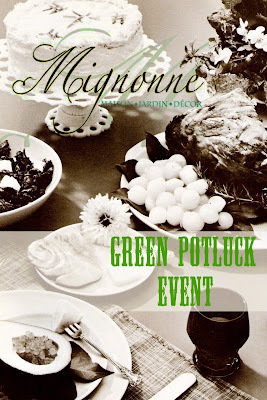 Mignonne's Green Potluck Event is TODAY, Saturday, September 6th, from 1:00 p.m. to 4:00 p.m. in our Old Oakland boutique. Leslie Lavitt is the proprietor of 2 Twigs & a Bay Leaf, a sustainable, community based florist in Oakland. 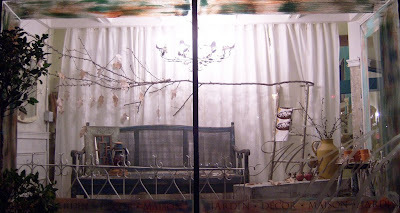 Her motto, "Work with what you have", is a “green” idea that 2 Twigs & a Bay Leaf capitalizes on. It’s what great chefs ask, much like food and wine, taking your cue from Mother Nature’s seasonal bounty. What is readily available in my garden, my friends and neighbors’ gardens? 2 Twigs & a Bay Leaf produces organic, relaxed floral designs while supporting the earth, recycling and reducing fossil fuels by using local materials, mostly what’s in the backyard. You’ll be amazed. 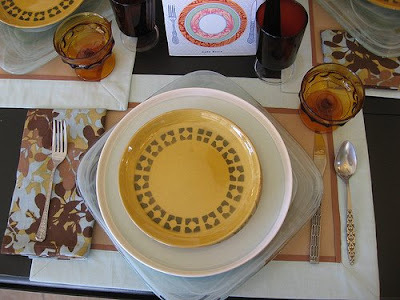 Leslie will be displaying her unique designs at our Green Potluck Event. Stop by for information and inspiration. Also partnering with us is Gina Pericini of Flock, a local designer who creates handmade silk-screened kitchen towels, cocktail napkins, and pillows. 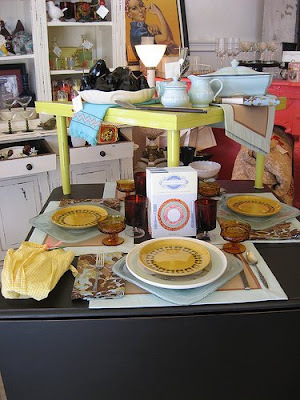 We recently began offering Gina's line of kitchen linens and the Green Potluck Event is a great time to stop by and check them out. We're moving towards entertaining season ... our special event is a great time to gain inspiration for refreshing your décor with a low impact to the environment. Of course, special in-store savings will also be offered during the event. Delectable nibbles from B Restaurant, G.B. Ratto & Co. International Grocers, Tamarindo Antojeria and Sweet Adeline Bakeshop will be offered "potluck style" on some of Mignonne's beautiful vintage tableware. (Click on the restaurant name for more information about our wonderful donors). 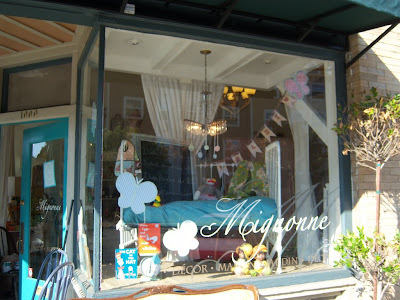 Mignonne extends our hours until 9:00 p.m. Friday, September 5th, in conjunction with Oakland's Art Murmur. The murmur is a group of galleries in Oakland which have openings the first Friday of every month, offering a tour, and because Mignonne shows work by local artists on a rotating basis we are a part of the "scene". This month's late night reception will feature our two local artists, Diana Blackwell and Paige Camerino. We are excited to host these two powerful women artists. Stop by for a glass of wine and peruse their work. Oakland's Art Murmur makes for a great Friday night, follow the tour and end up in Old Oakland's gourmet ghetto where you can enjoy a great meal, cocktails, and even the later evening party scene!